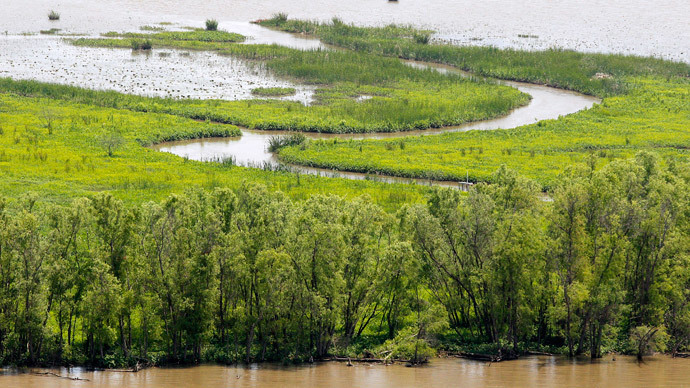 A federal judge has ruled that multinational energy corporations are not financially liable for erosion of Louisiana’s wetlands, 1,900 square miles of which have been lost since the 1930s. Industry admits to being responsible for 36 percent of that loss. US District Judge Nanette Jolivette Brown dismissed Friday a lawsuit filed in 2013 by the New Orleans-based Southeast Louisiana Flood Protection Authority-East against 97 oil and gas companies for deterioration of the state’s coastal wetlands. The lawsuit sought $50 billion in restoration compensation for an erosion process that the US Interior Department said is anywhere from 15-59 percent the responsibility of industry. Drilling operations have carved about 10,000 miles of canals through the state’s coastal marshes and swamps, according to the Associated Press. Industry, meanwhile, has admitted to 36 percent of the wetland erosion. Judge Brown said federal and state laws did not offer a legal avenue for the levee authority to bring the suit to fruition. The Southeast Louisiana Flood Protection Authority-East is one of two regional boards the state established after 2005’s Hurricane Katrina to protect New Orleans. Brown added that the levees protected by the regional authority were either too far from or not sufficiently affected by damage done from energy drilling. She said that the levee authority did not have the right to sue based on permits issued by the state or the US Army Corps of Engineers that gave the companies permission to drill. The Southeast Louisiana Flood Protection Authority-East said it planned to appeal the decision. According to the US Geological Survey, the state’s coastal wetlands are in danger of disappearing within the next 200 years. Amid climate change, the state has seen its sea level rise about twice as fast as the global rate in the last 50 years, according to the US Environmental Protection Agency. Last June, industry-friendly Gov. Bobby Jindal signed legislation that aimed to block the lawsuit before its hearing in court. In October, the bill was deemed unconstitutional by a state judge. Industry and its supporters have called the lawsuit an unprecedented attack on energy exploration by a “rogue agency ... trying to raise money through illegal actions,” said Senators Robert Adley and Bret Allain last year after they sponsored the legislation Jindal signed in June. John Barry, a former official with the levee authority, has said the suit is simply an effort to get companies to pay for the havoc they are responsible for initiating.